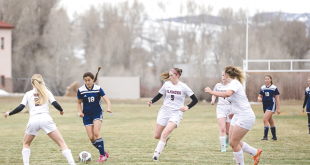 The Titans soccer team opened up the final week of the regular season with their annual overnight trip to the southwest part of the state to face Bayfield and Pagosa Springs on Friday and Saturday, October 14-15. They survived the attack of their opponents to come away with a tie and win and remain at the top of the league standings. Questions swirled around the Titans team heading into the weekend since the team was missing a number of players to the October break and had to call on a couple of players to jump into the varsity mix for the two league games. Friday night they faced the Bayfield Wolverines under the lights, and while Bayfield has struggled the past couple of seasons, it became apparent in the opening minutes of the game that the Wolverines were revamped and fired up. Bayfield opened the game setting a frantic pace, applying heavy pressure on the Titans and immediately taking Crested Butte out of their game. After the initial five minutes, the Titans adjusted their attack to match the Wolverines’ intensity and the payoff came when Noah Buehler stole the ball off a Bayfield defender and pushed it through to Merlin Mapes breaking free. Mapes settled the pass and drove his shot past the oncoming goalkeeper to put the Titans up 1-0 early on. Despite the deficit, Bayfield remained resolute in their effort and continued to frustrate the Titans with their organized defense and hustle at midfield. The Titans struggled to assemble any attack, but the defense came through numerous times as Tate Young and Woody Martineau were solid in the middle and flank defenders Wally Behrens and Garrett Pierson shut off the outside, leaving the game to be decided in the midfield. Bayfield’s hustle resulted in a broken play in the 68th minute as they jumped on an errant pass and scored to tie the game 1-1, eventually sending the game into overtime. The Titans buckled down in overtime to battle Bayfield head-to-head and came close, hitting the crossbar twice in overtime, but after both overtimes neither team found the final game-winning touch, leaving them tied 1-1. 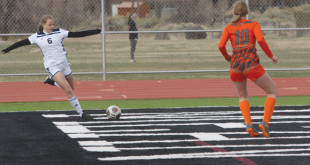 The Titans then had to regroup and return to the pitch Saturday morning to face the Pagosa Pirates. Having battled through two overtimes the night before, fatigue was the main concern heading into the Pagosa game, since the Pirates are known for going 9-0 for all 80 minutes. Remarkably, the Titans opened the game as if they hadn’t battled through 100 minutes of soccer the night before. Pagosa threatened early but after holding off the initial attack, the Titans worked hard to win loose balls and match Pagosa’s hustle for the remainder of the game. Pagosa had the better looks on net in the first half but goalkeeper Josh Pruett made the necessary saves and the teams were locked in a scoreless tie at halftime. Nothing much changed in the second half and it soon became apparent that the difference would come on a breakaway or a defensive miscue. The Titans committed two miscues down the stretch but escaped unharmed and then, with six minutes left, Mapes went to work again. Midfielder Patrick Seifert won the ball out of the air off a goal kick from Young and immediately turned up-field to slip a pass through the Pagosa defense to Mapes on attack. Mapes came through once again, holding off two Pirate defenders to drive his shot past the outstretched hands of the Pagosa keeper, sealing the 1-0 win for the Titans. The Titans are now in the crosshairs of their final three opponents, two of which have a shot at the post-season. Crested Butte faces the Ridgway Demons and the Telluride Miners on the road before returning home to host Bayfield on Friday, October 21 at 3 p.m. at Rainbow field.